An amazing combination of color, texture and design makes up the reversible four leaf clover necklace by Chopard. 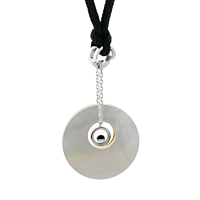 Adjacent to a round smooth mother of pearl disc nestles a smooth 18k rose gold clover, both attached to a white gold link chain. Inside the clover is a white gold circle featuring a .05ct Vs1 E-F color floating diamond. 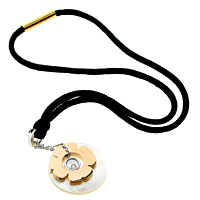 Both the rose gold flower and mother of pearl disc are in contrast to the sleek black cord necklace.